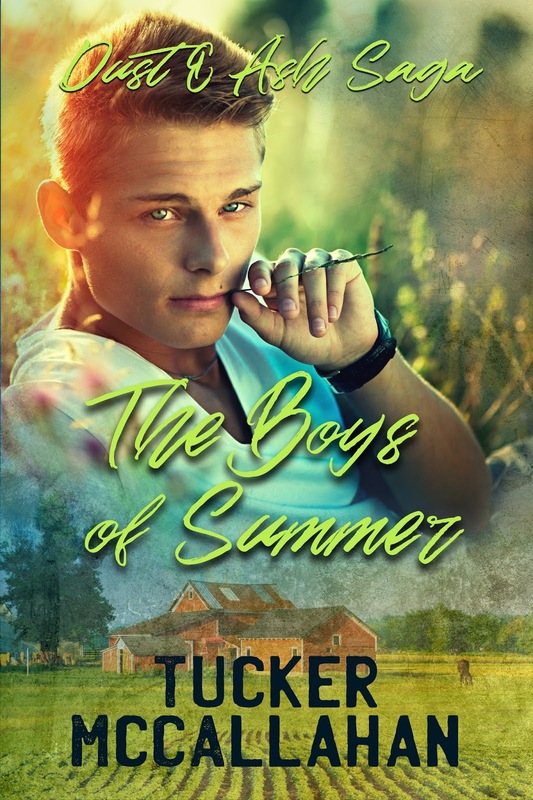 The Boys of Summer by Tucker McCallahan Cover Reveal! We’re really excited for you, Tucker!! In 2008, I was shopping in Giant Eagle with my partner, R, and Don Henley’s “The Boys of Summer” started playing over the store PA. At the time I was posting stories pretty regularly on Literotica under the screen name “WickedWendyDru.” As I listened to the song, I got the idea to create a story loosely based on the lyrics, a story that would be about summer love and the nostalgia associated with summers as a kid. That amorphous idea became the series “Dust & Ash,” which turned out to be my most popular and most read series on Literotica. Over the next few years, I grew dissatisfied with Literotica (for many reasons, but mostly because they were having plagiarism problems). I transferred “Dust & Ash” over to a new site, Gay Authors, and began the arduous process of editing and rewriting it, even as the serial continued to grow and won awards. Several times I was sure the series was going to be traditionally published, but each time that goal got close enough to touch, it slipped through my fingers. In 2014, “Dust & Ash” got put on hold while I dealt with a series of unfortunate events. Our family home was seized through eminent domain and we had to move. R was diagnosed with end-stage bone cancer. In 2015, my girlfriend K was diagnosed with stage 4 endometrial cancer. I ended up writing a short story for a charity anthology that released in June 2016 (“Stardust, Always”), the proceeds of which went to cancer research. That turned out to be ironic, as I was then diagnosed with metastatic thyroid cancer. So in three short years, three of us at the House That Love Built ended up going through the soul-numbing process of surgeries, chemotherapy, and radiation. K and I made it. R, sadly, did not. His death pretty much devastated me. We’d been together for twelve years. We were handfasted. If you believe in the concept of soulmates (and I do), he was one of mine. I wrote nothing for a year. But he’d made me promise him I’d publish, and that promise weighed pretty heavily on me. I didn’t want to write, or edit, and I certainly didn’t want to tackle the huge realm of self-publishing by myself. Enter Grace R. Duncan. The cover reveal for the first book of The Dust & Ash Saga,The Boys of Summer! Isn’t it glorious?? The cover was designed by Lex Valentine at Winterheart and features the character Dustin. The saga will be a set of six novels, including the never-before-published conclusion to the story of Dust & Ash. Each novel will feature a different character on the cover. Though the “original” story will continue to be available on Gay Authors (in the Premium area), the novels will feature new material as well as tighter, more cohesive storylines. So here’s how this is going to work. The Cover Reveal Event will last until Sunday night. On Monday, the novel will be available for pre-order on both Amazon and Smashwords. The official release date forThe Boys of Summer is Friday, August 31, 2018. Ash Redvers, the lead singer of a family owned and operated wedding band, deals with the sudden need to replace his drummer after an unexpected accident. When Dustin Davis shows up ready, willing, and able to play – not to mention gorgeous – Ash thinks it’s going to be the best season yet. But Ash has never had a boyfriend, and Dust isn’t willing to be a quick hookup. As the summer heats up, they’ll have to decide whether all they can make together is music, or if there’s something more for them after the Boys of Summer are gone. Seriously, this has been ten years in the making. Not so long ago, I wasn’t even sure that I’d be here now, much less be publishing D&A on my own. It’s scary and exhilarating and absolutely wonderful… And I really love sharing it with all of you, especially those of you who’ve been around since the beginning. To show that appreciation in a more tangible way, there are prizes to win during this event, and there will be more prizes to win over Labor Day weekend during the release event. Here are the details! *The relaunch/cover event will run from noon on Friday, August 17, 2018 until midnight on Sunday, August 19, 2018. *To be eligible to win prizes, you must leave a comment on the post that includes 1.) Your favorite thing about summer, and 2.) your email address. *Full list of winners will be posted on the blog, and winners will be contacted to claim their prizes by August 31, 2018. Thanks so much to all of my readers and especially to the amazing team of people who helped make this possible: Grace R. Duncan, Joe Bone (aka Mr. Grace), Tricia Kristufek, Sweet D, and Lex Valentine. You guys are rock stars in your own right, and I’m so grateful to you all. LEAVE A COMMENT to win, PRE-ORDER on Monday, and come on back AUGUST 31 for more prizes!! Such a sad story from the author, but I’m happy for them that they’re carrying on with their writing. I hope that it’s this blog where I’m meant to leave my comment. I love the fact that people just seem happier in the summer, less frowny faces when I’m out & about. I’ll preorder on Smashwords because then I’ll be able to leave a review on their site. We’ll make sure Tucker knows about your post – no worries 🙂 Thank you for commenting! Oh, oops, I didn’t see that link before. I’m so rubbish at this stuff. well at least I feel really happy to be the first person to get emails about new releases from & favorite Tucker on her Smashwords page, I added The Boys Of Summer to my library, too.